My aunt has been applying for work for more than one year now. Her husband got a new position in early 2013; so, he and his family left their home in Houston, Texas to relocate to the southeast region. Unfortunately, my aunt’s job did not transfer. And for the past year (and some change) she’s been looking for work each day. So, imagine her shock, excitement and relief when she received a promising email this past week. A job she’d applied for some time ago was contacting her to say she was being offered the position. Every job seeker’s dream, right? Well, in this case, not so much. After further inspection, my aunt soon discovered that her hopes were again about to be deferred; this opportunity had all the warning signs of a scam. My aunt is just one of the countless job seekers who encounter a false job advertisement/company during the job search. As if the job hunt isn’t already frustrating enough, especially today with the boom of technology, the unemployed have to also counter false claims that promise false employment opportunities. This was one of the issues with the job offer my aunt received. She never went on an interview. Unless you walk into McDonald’s, speak with a manager, and by some chance of fate, he or she tells you to start next week, you will ALWAYS have to go on an interview. Now they type of interview may differ: perhaps it’s just a phone interview or maybe you’ll have to complete several in-person interviews. But what’s important to remember is that the vast majority of companies will conduct interviews before making a decision. If you applied for a position online, and a few weeks later, the next communication you have from that business is that you’ve been hired, be aware. It’s most likely a scam. A tell-tale sign that you’re dealing with a job scam is if you cannot locate any record of the company. Most companies nowadays have a website and social media account(s). When Googling the company’s name, if very few or no records surface, proceed with caution. Even local small businesses that are either new or have been around so long that they’re run by older generations who haven’t adopted as much technology should still show up under the white or yellow pages in Google’s search results, on manta or merchant’s circle. You can also look to see if it’s listed under the Better Business Bureau. Although companies don’t have to be listed here, most do and if you don’t see any accreditation or a negative score from the BBB this should give you reasons to think twice about moving forward with this company. Most companies will ask you to input your SSN in their applicant tracking systems when applying online. But, if a business is asking you to email it your SSN, bank account information or any other very personal/confidential information outside of an actual ATS, don’t do it. This is a scam. 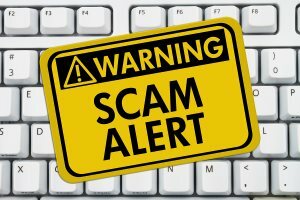 If you’ve ever searched for a car or housing on Craigslist where sellers ask you to click a link to send them your credit score before they can show an apartment, pay a reservation fee to view a condo or that they will ship you the car, requiring confidential information to apply during the job search is the same type of scam. Most companies don’t require startup fees for new hires; this one is simple. If they want you to pay upfront to “play,” this is a red flag. Check to see what others have to say about the company and/or its hiring process. Are there any reviews? Are they mostly negative? You may discover that their job scam is a common occurrence. For example, after researching, my aunt came across a complaint from a job seeker who said the company offered him a job without ever interviewing for the position. Save yourself the time and headache by reviewing other’s experiences before applying.